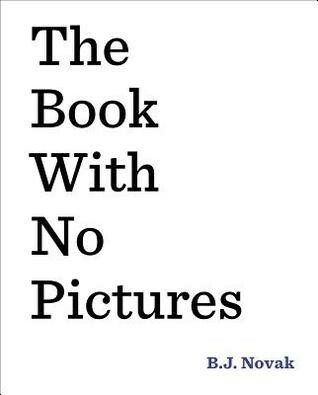 This book has no pictures. Literally none. Even though libraries and bookstores have it in their picture book section. What gives? What genius decided to market something like that to kids? 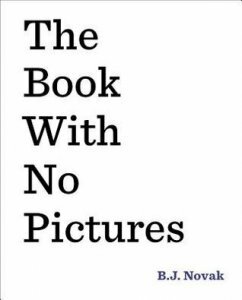 The Book With No Pictures is exactly as its title suggests. What the title doesn’t tell you, though, is that kids won’t be able to get enough of it. In a madcap celebration of language and reading aloud, B.J. Novak shows youngsters the power and humor of words. As he writes, “You might think a book with no pictures seems boring and serious. Except . . . here’s how books work. Everything written on the page has to be said by the person reading it aloud. Even if the words say . . . BLORK. Or BLUURF.” From there, the games have begun and the lucky soul reading the book aloud will find themselves having to say and do all sorts of silly things. Luckily for them, they’ll probably be happy to oblige a child’s requests to read it again. And again. And again. Parents will likely know Mr. Novak from his TV and film roles, but their kiddos will know him as one of the funniest authors around. Highly recommended, especially for reading out loud. Highly recommended. Molly Crumbley, Librarian, Maryland, USA.